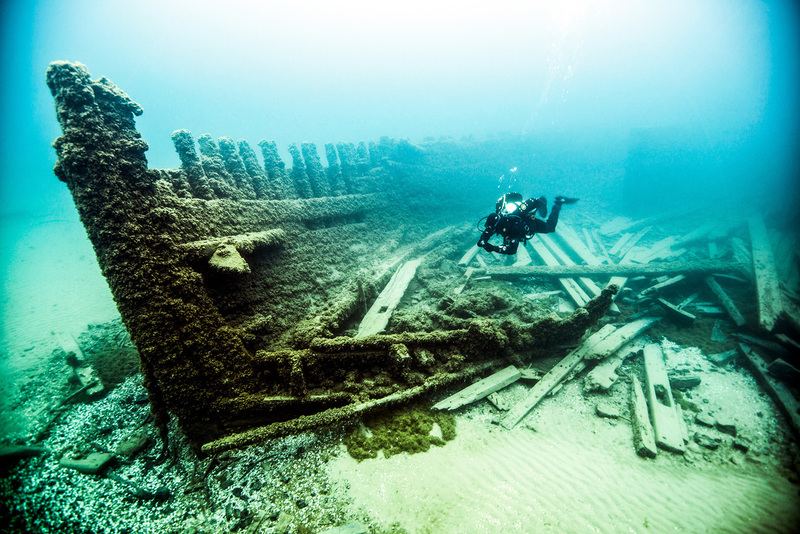 In Lake Huron, Underwater Treasures And A Marine Sanctuary Boost Tourism Industry Alpena, Mich., has turned the shipwrecks off its shores into a tourist attraction. Now, other Great Lakes towns are hoping to create freshwater marine sanctuaries of their own. A diver inspects the wreck of the Van Valkenberg, which sunk in 1887 two miles off Alpena, Mich. Tiny Alpena, Mich., used to be a bustling port, located right where the Thunder Bay River meets the northern edge of Lake Huron. The town's economy hinged on the ships and boats moving along the area's waterfront. But now the small town has shifted its fiscal focus to what lies beneath the water. More than 200 sunken ships line its shoreline in an area known as "Shipwreck Alley." In 2000, the federal government named the 448-square-mile area the nation's first National Freshwater Marine Sanctuary. Today, wedged between the riverfront and Fletcher Street in downtown Alpena is a former paper mill that is now home to the marine sanctuary's visitor center. The mill's old warehouses now house art, artifacts and interactive games. One display broadcasts old sailors' songs to a group of kids playing pirates. But the main attraction is on Thunder Bay itself. Down inside The Lady Michigan, a glass-bottom charter boat, passengers spy on shallow ship wrecks. Brandy Kozlowski squints through the glass at the splintered deck of The Shamrock, a wooden steam barge that sank in 1905. 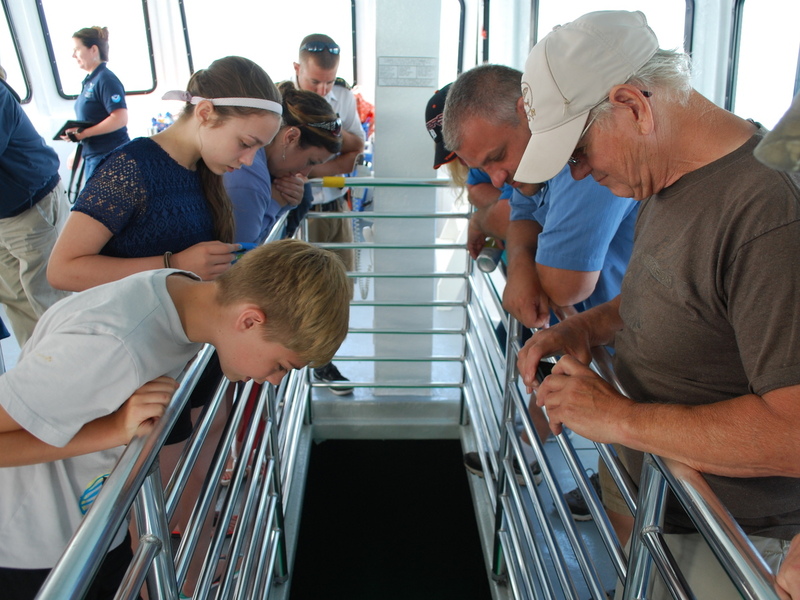 Passengers aboard the Lady Michigan peering through its glass bottom in hopes of spotting one of the area's many shipwrecks. Kozlowski grew up in Alpena but left Michigan years ago to find a job. Now back, visiting family, she says the town has changed a lot. "The Marine Sanctuary is all brand new," she says. "Everything over on that side of town is all brand new. It's good. It's good for the area, it really needs a boost." Alpena's shoreline has been the site of shipwrecks for centuries, thanks to the storms that give Thunder Bay its name. But tourism has grown since the National Oceanic and Atmospheric Administration granted the waters off Alpena sanctuary status — so far the only freshwater marine sanctuary in the U.S.
Local businesses are reaping the benefits. Joe Sobczak, of Thunder Bay Scuba, says he gets most of his business from tourists. But he used to work in the shipping industry, and says he isn't sure tourism jobs are enough to keep young people from moving away. "They aren't the same as a blue collar industrial job," he says. "You don't have the benefits. You don't have this pay scale." Still Sobczak thinks tourism is the best way to move Alpena forward. Downtown is full of shops that have adopted the shipwreck theme. Visitors can buy a maritime-blend coffee or an ice cream sundae named after a wreck. New businesses are coming in, too, including the first waterfront hotel on Thunder Bay River. Alpena's success has encouraged other communities along the Great Lakes to apply for National Marine Sanctuary status, too.